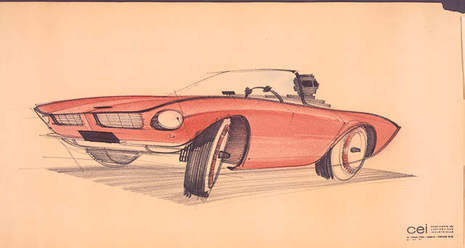 On March 22, 1961, industrial designer Raymond Loewy made a dozen sketches of a futuristic sports car at the request of Sherwood Egbert, the recently appointed president of the ailing Studebaker Corporation. Egbert hoped that Loewy, who had a long relationship with the company, could design a new car bold enough to capture the popular imagination and boost the company's sagging fortunes. Loewy and his team of designers produced a prototype automobile in record time; the Avanti—Italian for "forward"— debuted in April 1962 to rave reviews. The four-passenger car was indeed forward-looking, for it had a steamlined fiberglass body with almost no chrome, and was the first American car to incorporate a disc brake system along with other safety features. A series of problems stalled production of the car, however, and the Studebaker Corporation abruptly discontinued its U.S. manufacture late in 1963. Seeking to revive the popular model, in 1965 two Studebaker dealers acquired the corporation's vacated South Bend, Indiana, factory and as the Avanti Motor Corporation produced the Avanti II into the 1980s. Raymond Loewy, who is sometimes called "the father of industrial design," also designed automobiles for Hupmobile, Lincoln, and Jaguar, among many other projects. Born in Paris in 1893, he was educated in France as an engineer. Loewy emigrated to the United States after World War I, where his first design assignments were in window decoration for New York department stores. 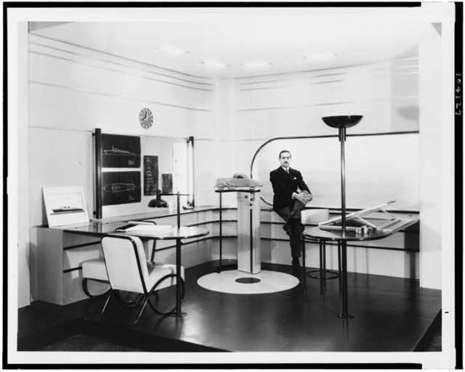 Loewy's signature streamlined style was eventually seen in a wide variety of industrial and consumer products, ranging from railroad locomotives to refrigerators, to pencil sharpeners, to dishes, to corporate logos. He became a U.S. citizen in 1938 and married Viola Erickson ten years later. Never Leave Well Enough Alone, Loewy's autobiography, appeared in 1951. In the early 1960s, Loewy was hired by the Kennedy White House for several projects; he also designed a commemorative postage stamp in memory of John F. Kennedy, in 1964. By 1967 he was employed by NASA to create hospitable spaces for astronauts. Raymond Loewy died in 1986.